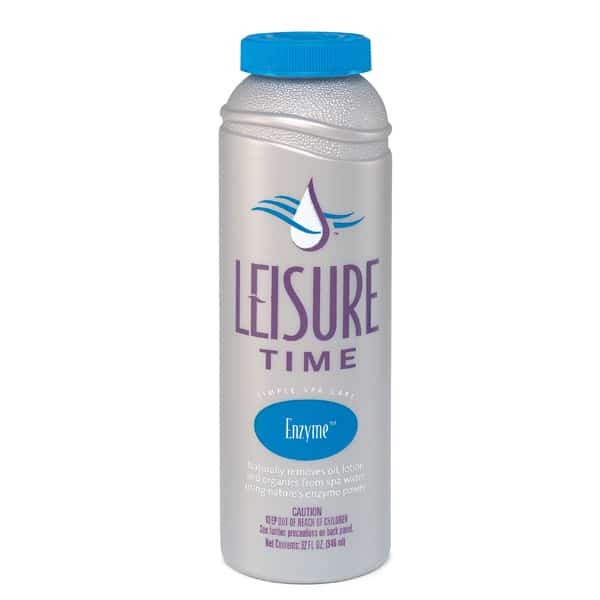 Spa Enzyme by Leisure TIme is a natural enzyme water clarifier for hot tubs and spas. The water clarifier helps to break down organic material that leads to scum lines and water rings. Regular use of Spa Enzyme by Leisure Time cuts down on the need for routine cleanings and filter maintenance. Application is easy: once per week, add 1 ounce of Spa Enzyme per 500 gallons of water. It doesn't foam, and is compatible with all hot tub and spa chemicals that you will find at Family Leisure. Enjoy clearer, safer water that works with your filter system rather than against it. In the game of spa and hot tub maintenance, staying regular with top of the line spa chemicals will save you money in cleaning and part replacement down the road. For online orders over $40 (before tax), shipping and handling is FREE. Orders that are under $40 will have a $5.99 shipping fee added. Most pool/spa supplies ship via Fed Ex and delivery times within the Continental U.S range from 2-5 days. All orders received before noon will ship that SAME DAY.